Get ready to have your creative volcano erupt!! and the smell of coconut and suntan lotion in the air. 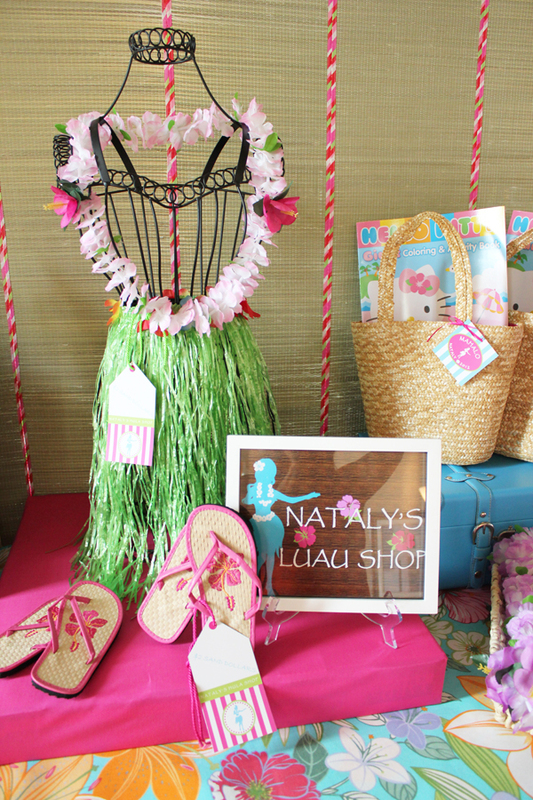 • Interactive Luau Boutique for party guests - with price tags & sand dollars provided for currency! BRiLLiANT! • Repurposed Night Stand used as the centerpiece on the Dessert Table. PERFECT! 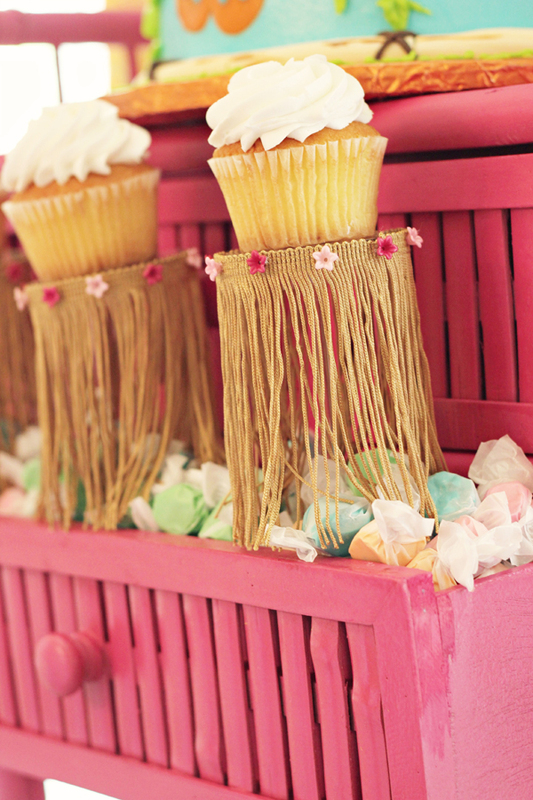 • Adorable Hula Skirts + The Pastry Pedestal used for displaying cupcakes. 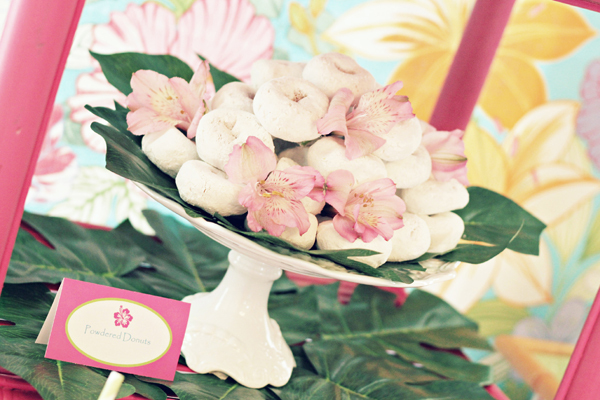 • Salt water taffy incorporated into the dessert table! LOVE! • Pink & Green SANDing sugars lining the serving vessels. Steffany is a long-time custom silhouette customer of mine - I adore her. 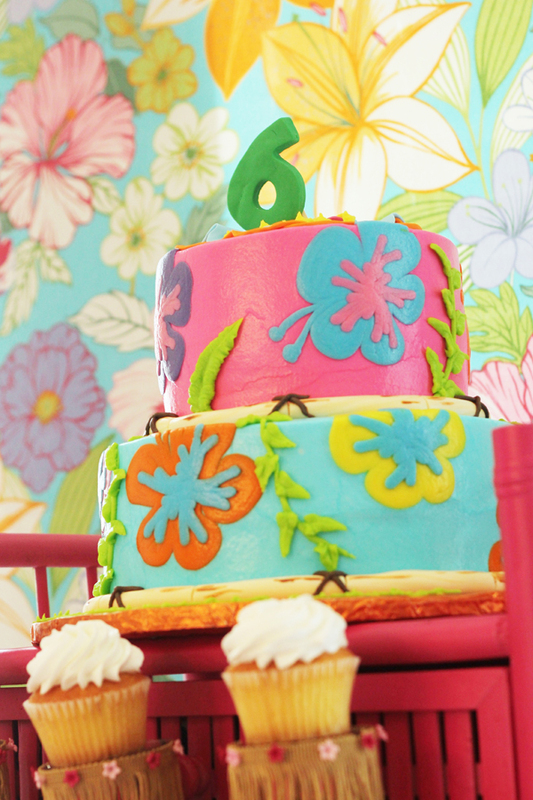 She did an absolutely beautiful job pulling all of the details together for her daughter's birthday. I really love how everything turned out! I also love her honesty about the one party detail she would change. 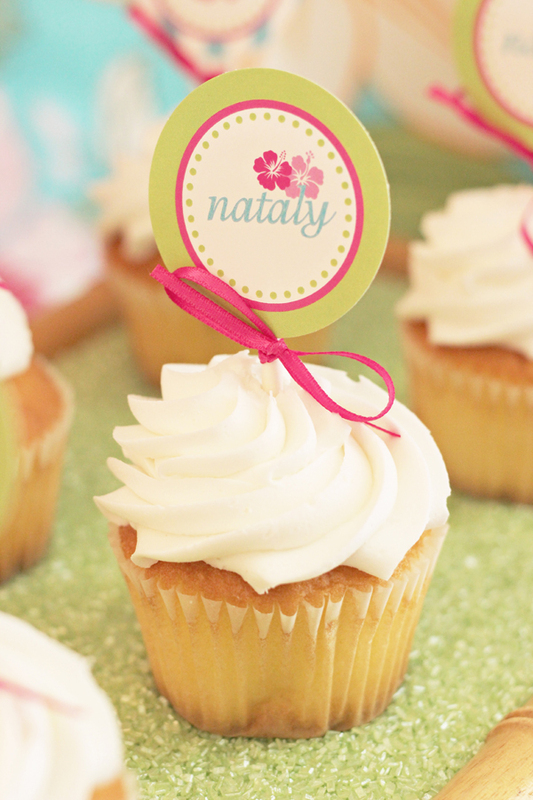 Steffany didn't need my help at all with these party printables! Please check out her new party printables shop on Etsy: Sugar Plum Party!! Thank you for sharing your creative talents with us Steffany!! "Years ago, during an end of summer clearance, I bought several matching fabric table cloths, in various shapes/sizes, with the matching napkins, and table runner. 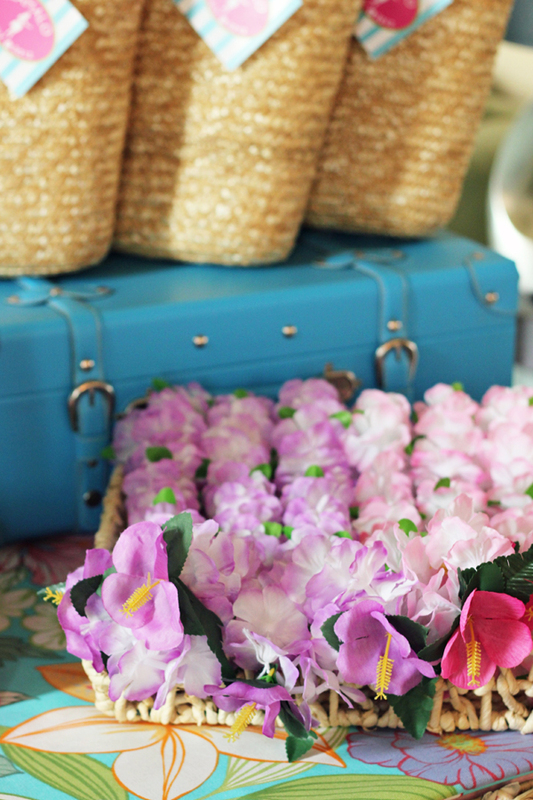 The table cloths featured a fun, tropical motif. 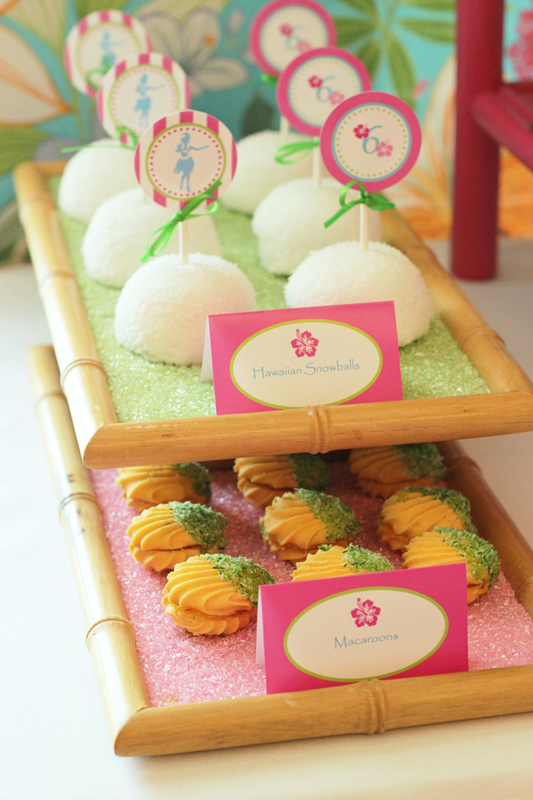 They were perfect for an end of summer luau, and were the perfect way to tie the main party elements together – the dessert table, the dining area, and the mock Luau boutique. The table cloths provided the inspiration for the theme and the color palette – which is primarily turquoise, bright pink, and touches of green." "To add unity to the party design, I created party printables. I absolutely loved how they tuned out. 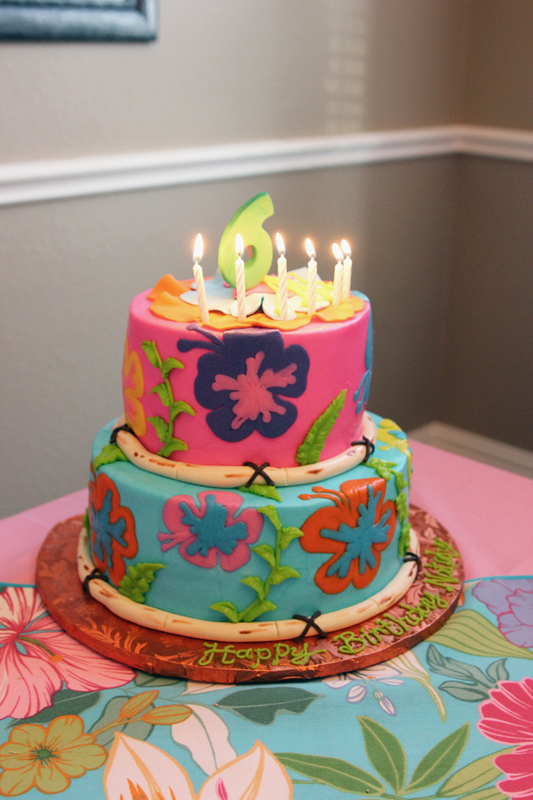 The design featured a Hula Girl Silhouette in a bright blue and hibiscus flowers. I used printables on the dessert table (food labels, candy bar wrappers, cupcake toppers, party flags), on the dining table (seat assignment tags), on the part favors (tag), on the Luau Shop table (Price Tags and Sign), as well as water bottle wraps and a welcome sign. They are available in my Etsy Shoppe (Sugar Plum Party). There were flower hair clips available for purchase in the Luau Boutique. These were made by taking a $1 branch of flowers purchased from the Dollar Tree, picking off the flowers, and hot gluing them to hair clips. 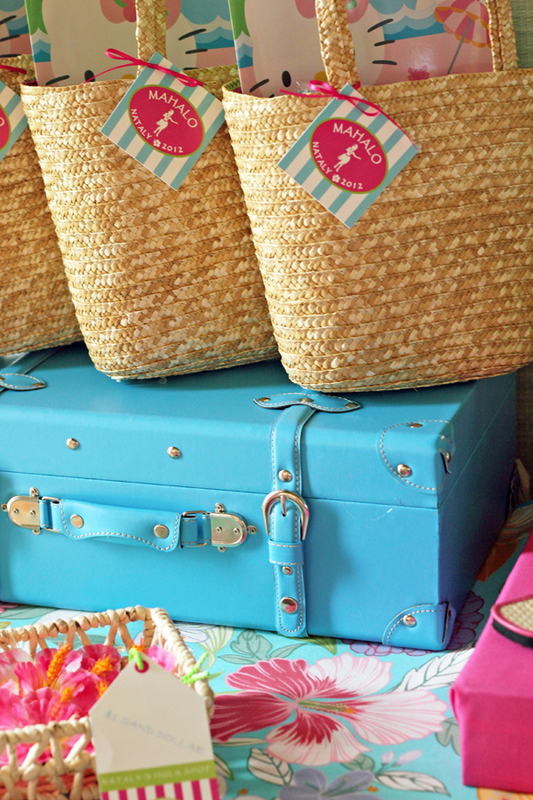 The backdrop for the Luau Boutique was made by sewing two straw beach blankets – the kind that roll up. They were already trimmed in the pink fabric – so it was an easy sewing project." "I have designed a few dessert tables over the years and I have learned that it takes a lot more “goodies” to fill a table that what you initially expect. Since this event was a small affair – just 10 girls – I opted to use a smaller table to not waste food. I also incorporated store bought goods as a way to stretch my budget. We offered Hawaiian Snow Balls (Hostess Snowballs), Vanilla Cupcakes, Hershey candy bars, birthday cake, donuts, and cookies. I found the coconut cups, which I adorned with a paper straw and party flag, at the Dollar Tree. 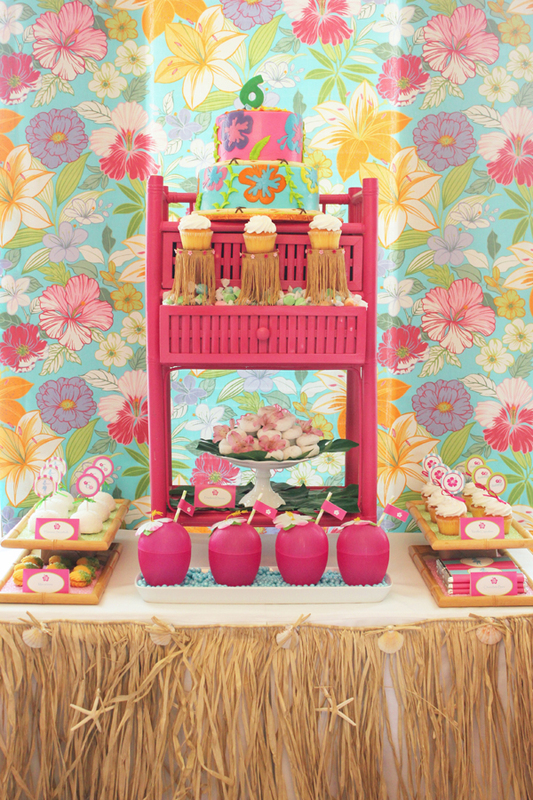 A tropical table cloth served as the backdrop for the dessert table. To give the table some interest, I added height by incorporating a bright pink night stand table that I bought on clearance for $30 at a local discount store. The night stand drawer served as the perfect place to incorporate The Pastry Pedestal. I placed foam in the drawer to serve as the base and then filled it with salt water taffy to hide the foam. 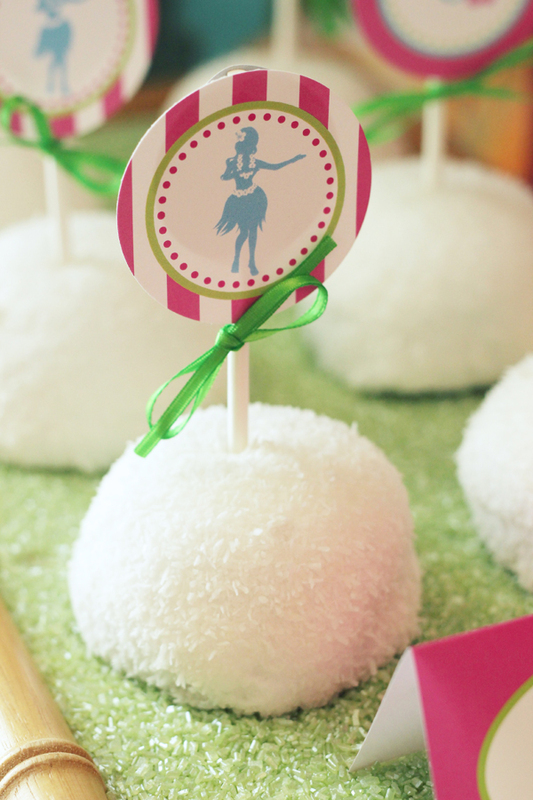 The Pastry Pedestal was dressed with a hula skirt, which was made by wrapping double stick tape around the edge of the Pastry Pedestal and securing fringe trim. I used a dab of hot glue to secure the ends and added some plastic flower beads to give them tropical detailing. I loved how the fringe gave them movement. They almost looked like they were doing the hula. I used bamboo trays that I had bought years ago at a yard sale. I filled them with pink and green sanding sugar to add some interest. The raffia table skirt, purchased from Oriental Trading, was secured to the white tablecloth using safety pins. It toned down the white and added a tropical feel. The leaves that were used with the donuts were bought from Oriental Trading." I used raffia table skirting around the perimeter of the table cloth, which is the same table cloth used throughout the party." "This was my favorite design element/activity of the party. I set up a table, which was supposed to represent a Luau Boutique, right at the front entrance. As each girl arrived, she was greeted at the door and given a little muslin drawstring bag, stamped with a sand dollar on the front, and filled with 10 sand dollars. It was like a money purse. Each guest was told to browse the Luau Boutique and to use her “sand dollars” to purchase goods from the shop. I used party printables to label the items with a price tag. All items for “sale” were bought from the Dollar Tree. The girls could purchase flip flops, a lei, a hula shirt, and a flower hair clip. 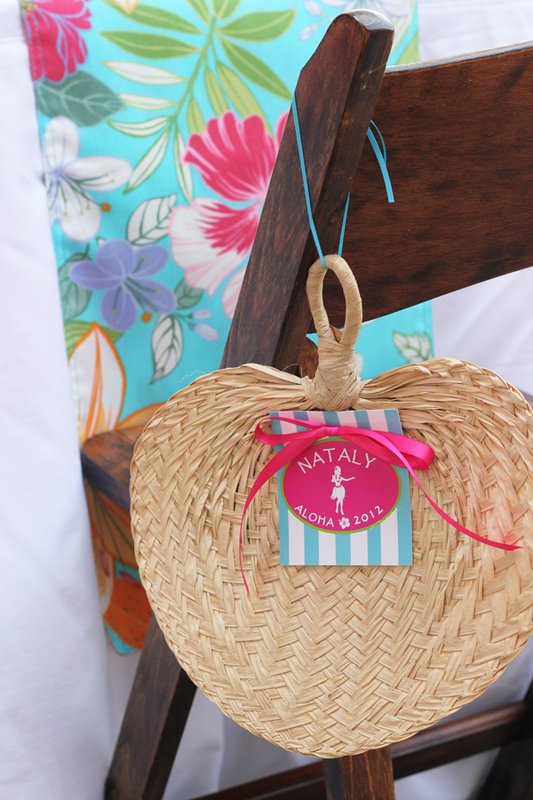 A “Nataly’s Luau Shop” sign was front and center, which my daughter loved." The girls absolutely loved this activity. Some of them had a hard time giving up their sand dollars; others couldn’t spend them fast enough. It was a blast! And, the pictures I have of the girls all dressed up are priceless." 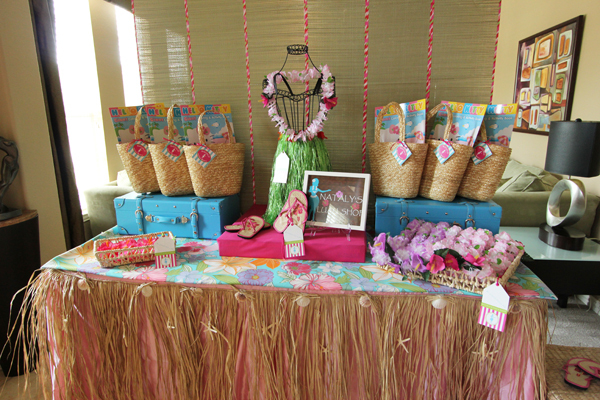 "The straw bags, displayed on the Luau Boutique table were the favor bags. They were filled with Hello Kitty coloring books, and were distributed at the end of the party. They were purchased for $2 from Target’s dollar bin area." "The girls ate outside for the party. I set up a long table, under a tented canopy to provide some shade from the Texas heat. 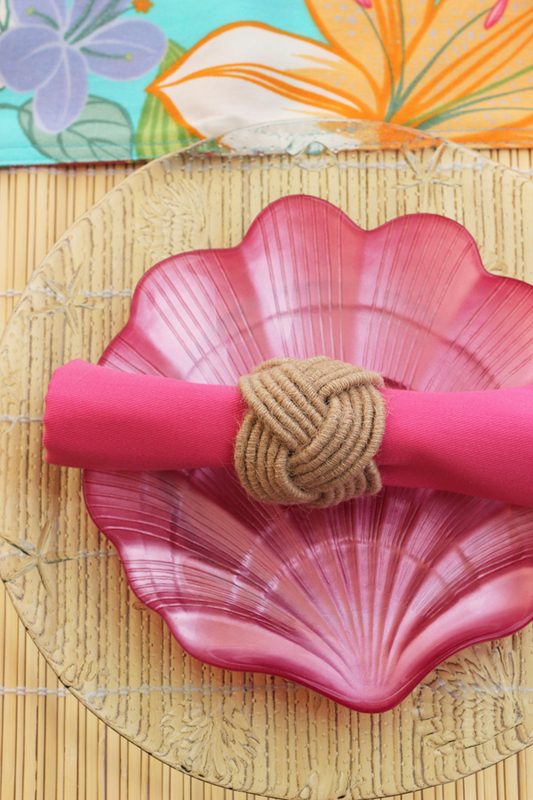 The table was covered in a white table cloth, with a table runner, matching the other tropical table cloths. At each place setting, I set a bamboo placemat, a shell shaped glass plate, and a coconut sipping cup, which I filled with an ice cream punch. The centerpieces were these gorgeous, white, tall candle holders, which had crystals dripping along the base. Instead of using candles, I filled them with blue tinted sand and added a few sand dollars. I found the centerpieces at Home Goods – love Home Goods. On each chair, I hung a raffia fan (Oriental Trading) that had a name tag, to serve as seat assignments." "I need to thank my husband, who put up with me for an entire week while I devoted myself to party set-up; my mother and father, who helped me to hang-up, set-up, and tear-down more stuff than I care to admit; and Christina Quach and Alyssa Lannoo, friends who took the wonderful photos during the event, while I frantically attended to 10 high energy 6 year olds." KEEPiNG iT REAL "PARTY EDiTiON"
"So every party host has at least one thing that they wish had turned out differently, right? For this party, it was the cake. What was I thinking? The cake blends in so well that it can barely be distinguished from the backdrop. I digress. Live and learn. It was delicious though!"